Hydroplane racer Ron Musson and the boat Miss Bardahl are the winners of the 1963 Martini & Rossi hydroplane awards presented at a recent convention of the American Power Boat Association here. 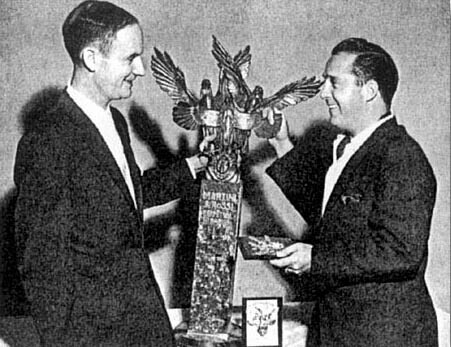 Musson received the Martini & Rossi Perpetual Trophy for having raced the fastest heat in the 1963 Gold Cup Race, held last July in Detroit. Miss Bardahl was the winner of the Martini & Rossi Trophy awarded annually to the boat which emerges as the national champion in unlimited hydroplane racing. The speedy hydroplane accumulated 2,025 points during the course of seven national hydroplane racing events in 1963. She is owned by the Bardahl Chemical Corporation. Gale V, owned by Gale Enterprises of Detroit, was runner-up with 1,800 points. Tahoe Miss was third with 1,395. Tahoe Miss is owned by Harrah's of Reno, Nevada. Musson was driving Miss Bardahl during the heat which won him his award. He ran through a 15-mile heat at an average speed of 109.48 mph.